Air pots are used in catering and party gatherings to serve hot or cold beverages. Air pots are insulating containers like a thermos. Hot beverages will stay hot for several hours such as tea and coffee, and cold beverages will stay cold such as lemonade and tea. Air pots have a pump that dispenses a few ounces of liquid at a time by using air pressure. Make sure you rinse your airpots out after each use and leave the lids off. You can trust the restaurant supply superstore for your commercial air pots for catering. Update International Airpot Brushed Stainless Steel Lined With Black Push Button Top - 84 Oz. Update International Airpot Brushed Stainless Steel Lined With Orange Push Button Top - 84 Oz. Update International Airpot Brushed Stainless Steel Shell and Liner With Lever Top - 84 Oz. 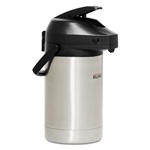 Update International Decaf Airpot Brushed Stainless Steel Shell and Liner With Lever Top - 84 Oz. 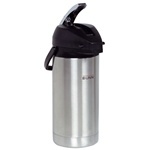 Airpot Stainless Steel Black - 2.5 Ltr. Stainless Steel Airpot Liner Push Button Black - 5.5 in. x 14.13 in. Buy wholesale airpots for catering and receptions to keep your soups and sauces warm before serving.